The Wild is a computer-animated film directed by Steve Williams, produced by Clint Goldman, assistant produced by John Burton and C.O.R.E. Feature Animation, and was released by Walt Disney Pictures on April 14, 2006, in the United States. The film begins with Samson, a lion, telling his son Ryan stories of his adventures in the wild. Ryan attempts to imitate his father's roar, but all he can manage is a squeaky growl. Ryan is teased by the zoo guests and he sulks away in his tree. During the night, when the zoo closes, all the animals are free to roam. Samson heads off to play the animal equivalent of bowls, while Ryan is taunted to come with his friends to stalk the gazelles like his father. Samson observes as his best friend Benny, a squirrel, tries to get Bridgette the giraffe to go out with him, but she is clearly not interested. Meanwhile, Ryan's friends sneak into the gazelle exhibit. Ryan tries to stop them with a roar, but growls instead. However, it wakes the gazelles into a stampede, which ruins his father's game. He gets angry at Ryan, berating him for spending all day sulking. Ryan retailates by saying he sulks because he would feel much better being a loser if his father wasn't 'Samson the Wild'. That night, Ryan accidentally gets shipped into the 'Green Boxes', which legend tells will take him to the wild. With the help of a pigeon, Samson and Benny go after him, sneaking into a garbage disposal truck. However, Nigel the koala, Larry the boa constrictor and Bridgette tag along to help as well, accidentally throwing Benny off the truck. After nearly being crushed in the garbage disposal, the group encounter a pack of rabid stray dogs. To their surprise, Samson makes them hide in the sewer rather than fight. There, they take directions from two street wise alligators who lead them to the docks. The next morning, the four friends steal a boat (quickly figuring out they can't actually drive it) to chase after Ryan's ship. They reunite with Benny, who has enlisted some Canada Geese to help steer the crew in the right direction. After several days, Nigel goes mad with the heat and thirst, and, under the impression they have hit an iceberg, jumps overboard. Luckily, the boat has run aground in Africa. The group quickly discover that all the animals in the area are being evacuated, as the nearby volcano has begun billowing ominous black smoke. They witness Ryan escaping, but he runs into the jungle before they can stop him. Samson attempts to use his instincts to find him, but it is quickly revealed that he has never been in the wild before. The rest of the group head back to the ship, but Samson decides to keep trying to find Ryan. While walking Samson sees plants and rocks turning into different colors; he thinks they are his senses. Nigel is captured by a group of volcano dwelling wildebeests, and their leader Kazar pronounces him King, based on an 'omen' he received when he was young. About to be devoured by lions, a toy koala fell from the sky (unknown to him it was actually from a plane) and scared the lions away, saving his life. Kazar wants to change the food chain; he no longer wants his kind to be at the bottom, but would rather see "prey become predators" and vice versa. For this, he needs to sacrifice a lion. Bridget and Larry are also captured and held prisoner. Ryan is left sheltering in a branch of an old tree, but he is attacked by three vultures acting under orders from Kazar. The branch breaks and traps his paw. Ryan attempts a roar but again can only manage a squeak. Samson hears Ryan's cries and runs to save him, scaring off the birds with a roar. The two apologise, but are interrupted by a pack of wildebeests. Ryan is shocked when Samson tells him to run. The two retreat to a tree where Samson reveals the truth - he was born in the circus and, like Ryan, couldn't roar. His father was ashamed, telling him a wild lion could roar, before allowing his son to be sent to the zoo, where Samson lied to avoid the shame. Meanwhile, the wildebeest discover them and, in the scuffle, send the tree over the cliff, with Samson still hanging on. Ryan is taken back to the volcano to be sacrificed. Samson is found later by Benny, and together they follow Samson's 'instinct' to the volcano in which the wildebeests are. This instinct turns out to be a group of chameleons who can camouflage themselves to look like they are leading his way - they help Samson because they want to see the wildebeests overthrown. Nigel tries his best to distract Kazar and the others from harming his friends (who are going to be cooked in a fire for dinner), but eventually Samson appears. He ends up fighting Kazar in order to protect his son. As they fight, Kazar orders the other wildebeests to help him. His second in command, Blag, tells him that the wildebeests are tired of pretending to be something that they're not, and refuse to help. In response, Kazar continues fighting by himself - but both Samson and Ryan finally find their real roars. Samson's roar is so powerful it knocks over rocks and triggers the eruption of the volcano. The animals hurry outside, but Kazar remains, ecstastic about finally being 'top of the food chain'. However, he is crushed by rocks as the volcano explodes. Luckily, Samson, Ryan, Bridget, Nigel, Larry, Cloak, Cameo, Blag and the wildebeest all escape, leaving the wild just seconds before the volcano triggers an eruption that destroys it completely. Ryan tells Samson that he is glad that he saw the wild before it disappeared and Ryan and Samson reconcile. Both are happy that they found their roars. Benny tells Bridget that she is more than just a 'goddess', that she's also strong and independent, much to Bridget's delight, and she kisses him. Blag and Samson begin a dance off, and all the animals join in. It ends with a fade out but, before total blackness, the music pauses and one of the wildebeests peers through the hole, which closes on his neck and chokes him. He coughs and Nigel appears, holding the Statue of Liberty torch that he has carried throughout the film, and hits the wildebeest with it. He then apologises to the audience, breaking the fourth wall in the process. The Wild received some harsh responses even before the trailer premiered. Movies.com described it as "Madagascar meets Finding Nemo with The Lion King thrown in for effect." 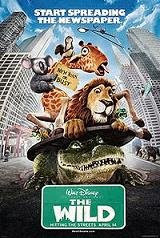 The movie has many similarities to Madagascar including its setting in New York's Central Park Zoo, similar animals as characters, and the primary plot of introducing zoo animals to the wild. The name of the film and the tag line, "Start spreading the newspaper", a play on the opening line from the "Theme from New York, New York", were both used as integral plot points in Madagascar. Rotten Tomatoes describes the critics' consensus on The Wild as "With a rehashed plot and unimpressive animation, there's nothing wild about The Wild". The common theme with Finding Nemo is an animal father on the search for his kidnapped son.. This would not be the first time for Disney and Dreamworks that two films with a similar theme were released in proximity timewise. In the fall of 1998, Dreamworks released its talking bug film Antz mere weeks before Disney/Pixar released A Bug's Life. A similar scheduling occurred in 2000 when Dreamworks released The Road to El Dorado against Disney's The Emperor's New Groove, both set in Central/South America, using similar animation styles. Later on in 2004, Dreamworks released Shark Tale, which had an underwater theme resembling that of Pixar's Finding Nemo (2003), and the new film Ratatouille has a rodent-themed world like Flushed Away (although Flushed Away was merely helped by Dreamworks).